A Factory Farm—26,000 hogs and 6.5 million gallons of untreated liquid manure—in the Lake Superior Basin? The Red Badge marks the proposed site of the factory farm. Notice how close it is to the lake. Click the + button in the map and drag the map around to see how the site fits within the Fish Creek watershed. 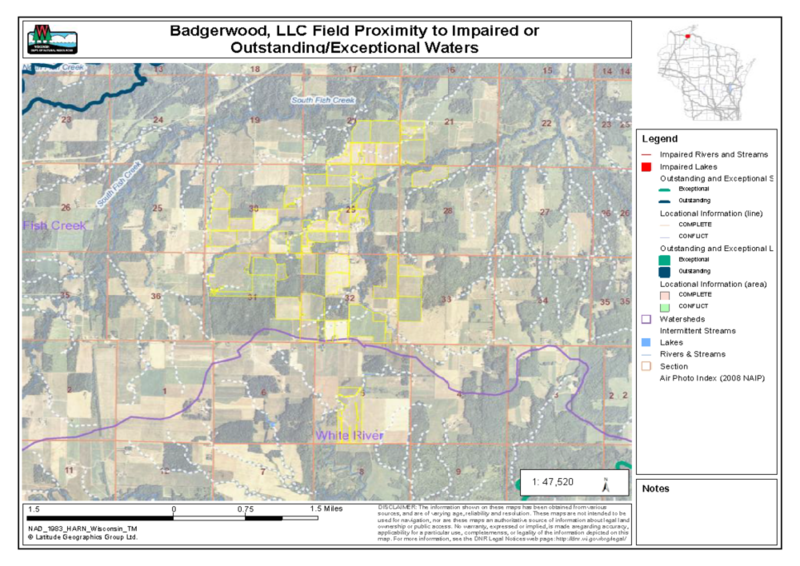 A CAFO in Bayfield County? 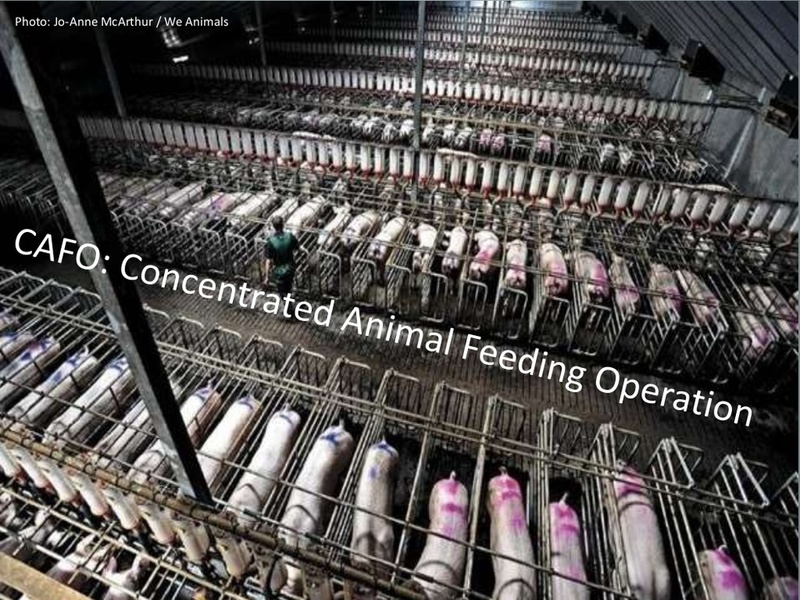 Bayfield County, Wisconsin’s Crown Jewel, may soon join the ranks of the 57 other counties in Wisconsin with a CAFO (Concentrated Animal Feeding Operation—A Factory Farm) operating within its borders. Except, unlike the 57 other counties, Bayfield County’s northern border is Lake Superior and 10 percent of the world’s fresh water. 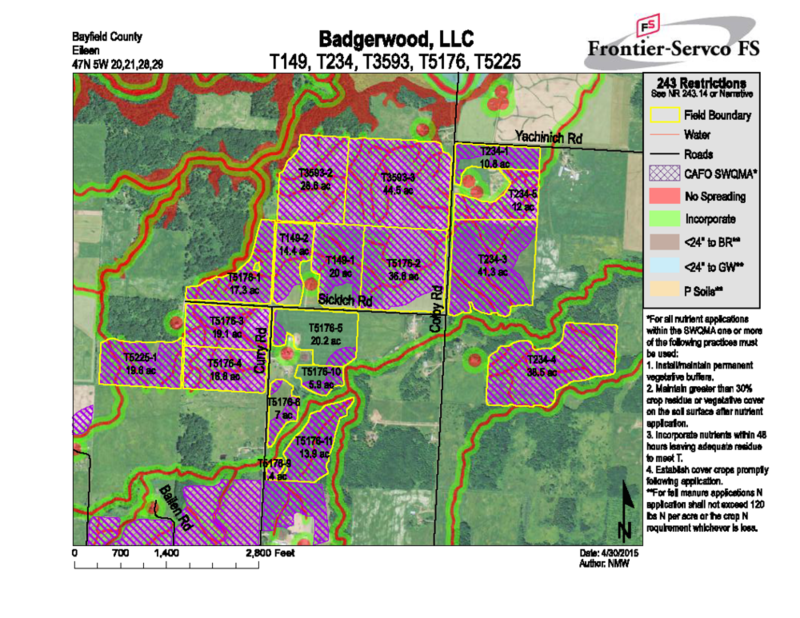 The Badgerwood CAFO site is at the intersection of Franzel and Curry Roads in the town of Eileen, in the Fish Creek Watershed, and less than 8 miles from the Chequamegon Bay and Lake Superior. *Fields slated to receive huge amounts of untreated manure produced by this facility are also located throughout this same area. *See (Lack of) Regulations for more information about manure spreading, etc. Reicks View Family Farms* from Iowa submitted a final application to the Wisconsin DNR in February 2015 requesting a Wisconsin Pollutant Discharge Elimination System (WPDES) permit for the 6.4 million gallons of liquid manure produced annually by 100 boars, 7,500 sows, 4,125 (55 pound market weight) pigs and 14,625 (0-55 pound) piglets. 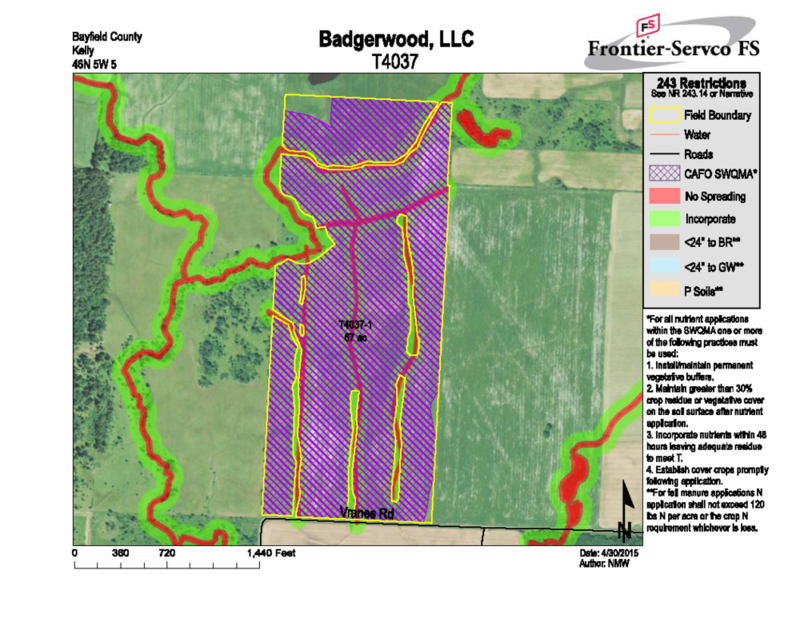 In a document given to a group of officials from Bayfield County, Reicks said they chose the site in Eileen Township because of "its natural seclusion" to start a hog farrowing (birthing) facility. *See Badgerwood 101 for more information about Reicks View Family Farms. Why Is Reicks Leaving Iowa? Reicks is leaving Iowa because of the PEDv (porcine epidemic diarrhea virus), a corona virus with a nearly 100 percent mortality rate in suckling pigs. by an incurable disease that’s the result of poor animal husbandry practices in his home state of Iowa. 10 percent of the world's fresh water is of more value to this planet than cheap bacon and pork tenderloin. 26,000 hogs & 6.5 million gallons of untreated liquid manure do not belong in the Lake Superior Basin. Plans to bring even more hogs and manure to the area? 2. Check here if there are no proposed increases at this site within the next five years. 3. Check here if no expansion is planned at this site within the next five years. Dale Reicks did NOT check either box. He has PLANS TO EXPAND IN BAYFIELD COUNTY, plain and simple. Growth and expansion is the name of the game for factory farmers.